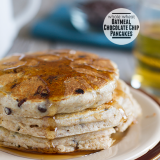 An easy recipe for whole wheat oatmeal pancakes packed with chocolate chips. In a food processor or blender, combine the oats, flour, baking powder and salt. Pulse until the oats are ground finely. Pour the mixture into a large bowl. Combine the egg whites, milk and vegetable oil, then gently stir into the dry mixture. Stir just until combined. Let sit for about 10 minutes. Heat a griddle over medium heat. Spray with nonstick cooking spray. Gently stir the chocolate chips into the batter. Pour about 1/3 cup of the batter onto the hot griddle. Cook until the pancake starts to bubble and browns on the edges, then flip and cook on the second side. Continue until all the pancakes have been made. Adding a full 1/2 cup of mini chocolate chips adds quite a bit of chocolate flavor. Feel free to cut back on this amount if you want less sweetness.